The Bespoke Tailors Benevolent Association dinner is a wondrous thing. 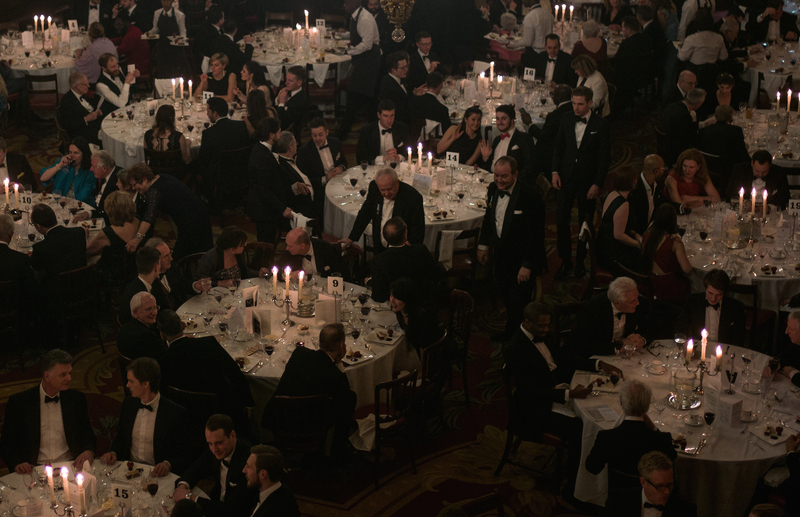 Every year, 300 or so tailors, friends and cloth merchants gather at the Merchant Taylors’ Hall on Threadneedle Street in London. There are speeches; there are medals; there are toasts. Everyone stands up and shouts ‘The Queen!’ then sits down again. It is put together by committees. There are officers and a hierarchy. Everyone wears black tie and casts sideways glances at the fit of each others’ jackets. The antithesis of Pitti in that respect: everything sober, classic, bespoke. You also get announced as you walk into the room. I always loved that part. So ridiculous yet somehow so dignified. I’ve been to the dinner perhaps half a dozen times in the last 10 years. I last went 2 years ago. 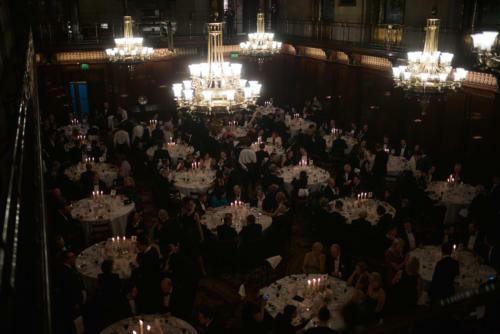 But this year it struck me particularly hard what a wonderful event the BTBA dinner is. Yes, the speeches often last too long, and yes it is a very hot, close place to sit for two hours. But in an age when we bemoan the lack of appreciation of craft, this event does so gloriously every year, with a degree of pomp and celebration that borders on the silly. If someone suggested creating an event like this today, they’d be laughed out of the room. 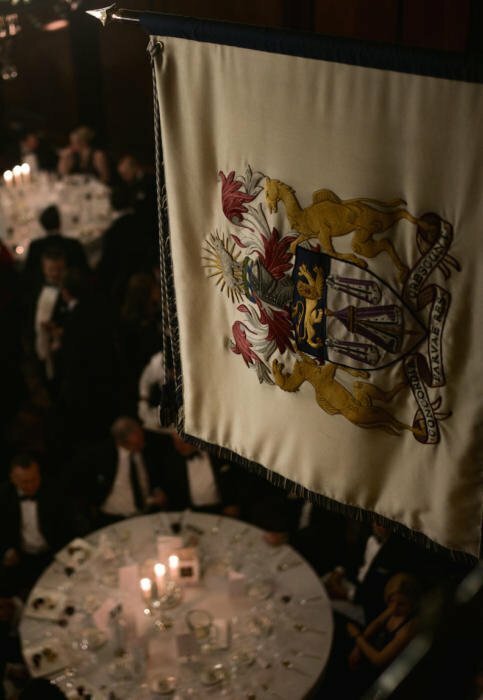 Although it is held in the Merchant Taylors’ Hall, the tailors don’t receive anything more than use of the hall. This is a commercial space and they pay the going rate for food and drink. At the same time, they raise thousands of pounds for charity (to support tailors with problems or out of work). The popularity of the dinner shows no signs of waning. But eventually, as the trade becomes more international (more travelling, more clients using different tailors) it would be great if the BTBA brought in more foreign tailors. Few places outside Naples could support an association this big, and tailors have far more to gain from working together than apart. Tomorrow: the best dressed men on the evening. 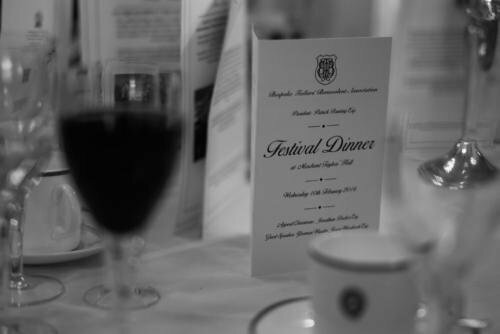 You can follow the discussion on The bespoke tailors dinner: an homage by entering your email address in the box below. You will then receive an email every time a new comment is added. These will also contain a link to a page where you can stop the alerts, and remove all of your related data from the site. Simon, what weight fabric is best for black tie? My Saville Row tailor is adamant that 11oz is the max since it would be too hot otherwise. Thank you for this insider’s view. What are the speeches about? Is it the craft itself, recent developments on the (menswear) scene, members being honoured…? As the event is so British (Victorian? ), I guess some of the more formal cuts will be among the best dressed? The speeches generally honour officers who are stepping down, or stepping up. And there is a guest speaker – this year, a beefeater from the Tower of London talking about life living in the tower. Slightly off subject, but can I ask your opinion on the weight of fabric for morning suits? I have seen a nice grey pick and pick fabric for a three-piece grey morning suit but it is only 9oz. Do you think this is too light and would wear too quickly, or would it be OK? Only going to be worn 2-3 times per year. It certainly wouldn’t wear too quickly if it’s only worn that often. Can I ask what weight of material you would suggest for morning dress and Dinner suits? As morning dress is mainly worn in the summer in the UK, and is a three-piece ensemble, do you think 10-11oz would be about right, or would you go for 12-13oz? 10-11oz shouldered ok if only infrequently worn shouldn’t it? For a dinner suit, would you say 12-13oz? I tend to think that it is better to be a bit cooler than overheat. I have my father’s dinner suit which he had made at No 1 Savile Row (Hawkes and Co) in 1946 for his 21st birthday. It is a heavy barathea, 14ozs+, and, according to my tailor, has only a horsehair canvas with no padding, and just light wadding in the shoulders. He says has never seen anything like it. Interestingly, the fly and brace buttons are by hand, as are the sleeve buttons, but the fastening button on the coat is by machine. I also have the invoice. 58 guineas. 58 guineas for a dinner jacket and trousers, even in 1946, seems to be enormously expensive. If you look on youtube, you’ll find a Pathe newsreel “Shoes for the famous” of 1945, featuring a visit to John Lobb. At the end the speaker announces in his plummiest voice: “You can have a pair made yourself for around 10 guineas”, when presumably the whole cinema audience would have ooght and aaght: “That’s ridiculous!”. So back then, you could have bought almost six pairs of bespoke JL shoes for the price of a SR dinner suit. The mind boggles! Simon as befitting the event (benevolent fund) it would be interesting to know what the fund does, how it works etc. Tailoring will not make many rich so it is good to know someone is looking after them in their dotage. Indeed if the Houses were more organised the could, collectively, add some form of levy (say £10) onto each garment. Nice tale by Inkster..worth noting that the 45 guineas is today worth approx. £1,200. Interesting thought. Although Hawkes as such are no more, I wonder what the cost would be for an equivalent from G&H today? Any idea Simon?